Behold a vivid new example of the revolving door between public service and corporate employment. A Michigan State Police captain helping oversee a $12-million information technology contract is switching sides, Paul Egan of the Detroit Free Press discovers. Capt. 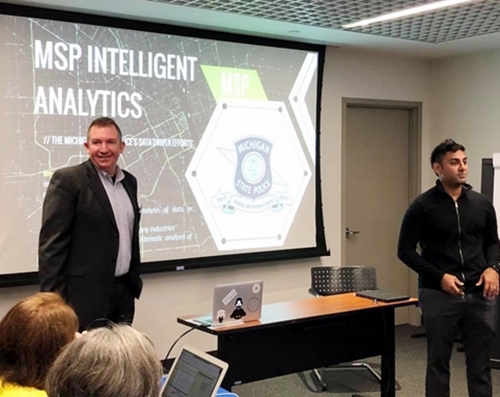 David Kelly, left, and state police colleague Deepinder Uppal tell other customers how they use Information Builders' software. Agency officials confirm that Capt. David Kelly retires April 30 to join Information Builders, Inc. in New York. That's the software firm hired by his agency "to create and expand a massive database of citizen information as a crime-fighting tool," Egan writes in his scoop. Chief Innovation Officer Deepinder Uppal resigned April 8 after the company expressed interest in recruiting him in January, but said he has multiple job options, [a state police spokeswoman] said. Both men are so tight with Information Builders that they gave a presentation at the Midtown Manhattan headquarters to "high-level customers," as the firm posted after the briefing shown above. The October 2017 topic was how their force uses the vendor's software for data-driven crime-fighting. ► Update: "The MSP does not have any concerns about Captain Kelly accepting a position with Information Builders," public affairs manager Shanon Banner tells WXYZ. Some states require a cooling-off period for state officials involved with vendor contracts, but not Michigan, which is consistently ranked at or near the bottom nationally for ethics and transparency rules. . . .
Gov. Gretchen Whitmer . . . has called for a five-year cooling off period before state lawmakers can become lobbyists. That proposal wouldn't cover agency managers such as Kelly and Uppal. I was working on a story about the multimillion-dollar database systems at the Michigan State Police when I found out the top two officials overseeing the project -- one of whom I had already requested an interview with -- were leaving the MSP after the vendor sought and received permission to recruit them.